Set in six hectares of citrus groves in the village of Altarello, the Hotel Ramo d’Aria is 45 km from Catania airport, 3 km from the sea (Riposto Marina) and just over 30 km from Mount Etna. A renovated former winery; the contrast between the sea and Mount Etna that frames the landscape. Here, the serenity of a country house mixes with the sea air, rising up from the Mediterranean just a few kilometres away; the rooms are immersed in the scent of the citrus trees and the greenery that surrounds the building. 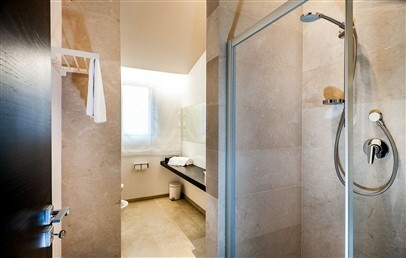 Ramo d’Aria has 11 rooms. 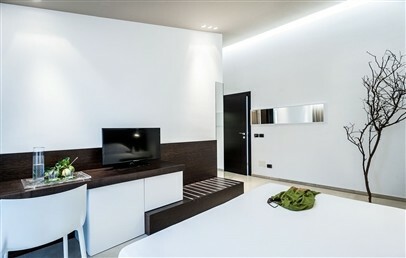 They have complimentary Wi-Fi internet connection, minibar, safety box, hairdryer, flat screen televison. Standard – located on the first floor, double bed or twin beds, bathroom with shower. Superior – located on the first floor, double bed or twin beds, bathroom with shower; possibility to add a 3rd bed. Superior Plus – located on the ground floor with individual entrance, double bed, bathroom. Possibility to add a 3rd queen size bed (125x190). 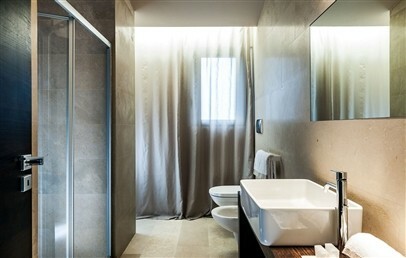 Junior Suite – located on the first floor with individual entrance by a staircase, small balcony on two sides, double bed with big round bathtub, bathroom. Possibility to add 3rd and 4th bed. Hotel Ramo d’Aria offers a breakfast buffet service. Swimming pool with sun deck set in the citrus groves; Wi-Fi connection in common areas and in the rooms, relaxation area; bikes available for guests; large car park; concierge; possibility of organised excursions to explore the local area. Stylishly furnished room with simple and modern lines. En-suite bathroom with shower. Sea view or total or partial view over Mount Etna. Some rooms have a balcony. Stylishly furnished room with simple and modern lines. En-suite bathroom with shower. Sea view/garden view or total or partial view over Mount Etna. Some rooms have a balcony. 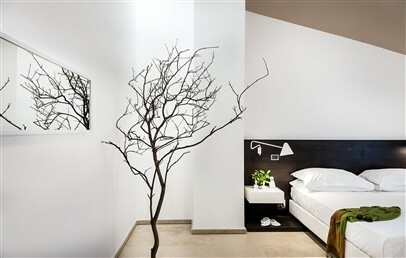 Stylishly furnished room with simple and modern lines. Located on the ground floor with individual entrance. Bathroom with circular bathtub. Possibility to add a 3rd queen size bed (125x190 cm). Balcony with view over Mount Etna/sea views. Stylishly furnished room with simple and modern lines. It is located on the first floor with individual entrance by a staircase and has small balconies on two sides. The Junior Suite is spacious with a living corner and a tub for two inside the room. There is the possibility to add 3rd and 4th bed. The view goes over the sea and/or Mount Etna. Long Stay - 20% reduction for minimum stays of 7 nights! Long Stay - 15% reduction for minimum stays of 4 nights!